Theresa May is no stranger to playing a leading role in national politics. So today, I’m going to take a look at her background and the first few of her policies and what these mean for the next five years of government policy. Born in Eastbourne in Sussex, May is the daughter of an Anglican clergyman. She went to a mixture of private, state and grammar schools and was admitted to Oxford University to read Geography, she gained her BA degree in 1977. May worked in a variety of positions, including for the Bank of England and the Association for Payment Clearing Services, while also serving as a Councillor for eight years in the London Borough of Merton. She first stood for election (unsuccessfully) in 1992 and was also unsuccessful in the 1994 by-election, before finally being elected in 1997. In 2010 she was appointed as Home Secretary by David Cameron, shortly after the Conservative and Lib Dem coalition was formed. She still holds this office today. On the private side of life, Theresa married in 1980 but has no children. She is a practicing Christian who still attends Church of England worship on Sundays. So why is she important? And what influence will she have on government policy over the next five years? The Home Office is huge. Like, really huge. There are 25 different agencies involve in the business that it covers so there is no way that I will be able to cover all of Theresa May’s policies, opinions and statements in one installment of Tory Watch. You could write a dissertation on this and still have a sketchy account. So I want to focus on two things to start with because they are front and centre in the Conservative Government’s current agenda. The Human Rights Act and its impact upon Counter-Terrorism and Crime Prevention, and Cyber-Security. May has publicly stated that she wants to see the Human Rights Act repealed, so she will be working to support Michael Gove‘s efforts towards this aim. Well, the Act has prevented her from taking immediate action on some of the issues which have been front and centre during her tenure in the home office. The HRA prevents immigrants from being deported for a variety of reasons. Arguments used in court to prevent such deportations include the right to family life, preventing parents from being separated from their children, or the right to life, blocking extraditions to countries where deportees will face the death penalty for alleged or actual crimes, which in some cases include their sexuality. The HRA also enshrines the right to fair trial, meaning that immigrants cannot be deported to countries to stand trial against evidence which has been obtained using illegal methods such as torture. May has been openly critical about the HRA, and scathing in her commentary, mentioning one case where an immigrant fought against deportation under his right to family life, including details in his evidence such as the family’s pet cat. May has been criticised by human rights organisations for her misrepresentation of the facts in this case, but comments such as these show her disdain for this piece of legislation. May has struggled to deport terrorists and activists as a result of the HRA, including Abu Hamza. She’s been found guilty of contempt of court for refusing to release detainees as well. She has also had a rough time of things from ISIS members such as Abu Rahin Aziz (who called upon British Muslims to kill May) and has faced criticism over several high profile deportations during her tenure. It’s not hard to see why she has supported calls for the scrapping of the act, there are interpretations of it which must make parts of her job in these areas extremely difficult. However, the decisions of this magnitude are meant to be difficult, and these rights do have to be protected, for everybody. This is the distasteful side of fair treatment by law – the bad guys have rights too. And just because that gets in the way of us treating them the way we think they should be treated, that’s not a good enough reason to get rid of those rights. Once they are gone, they are gone for everyone. May’s current focus in terms of legislation is the ‘Snooper’s Charter’, which includes measures to increase surveillance of the UK populous, requiring ISPs to collect and store significant amounts of data to be made available to government and security services. This intention has been around for a while, but it is far more likely to go through parliament now without the Liberal Democrats blocking it. In theory, the Draft Communications Data Bill is bring brought in in order try and combat terrorism. It’s being proposed in the Queen’s Speech on May 27th. That’s Wednesday. This Wednesday. Wake up and pay attention guys – this is happening right now. While that is the stated intent, I for one am not sure I want this government to have access to such a story of data. And here’s why. The Human Rights Act prevents people from being tried for ‘crimes’ that they committed prior to legislation being passed which makes such acts illegal. I have a big problem with where that scenario could lead. It is all well and good for people to say that surveillance is harmless so long as you obey the law. But when the government simultaneously have control over what is legal, what is classed as ‘illegal’, what punishments apply for ‘illegal acts’ and access to mass amounts of data which record and document our movements and activities online, that line is not so clear cut as you might think. How long will it be before blogging negative information about the Government becomes a ‘treasonous’ offence..? The combination of a home secretary who refuses to act upon court orders to release detainees, who wants to get rid of legislation protecting our right to fair trial, right to life and right not to be prosecuted for crimes which were not illegal when committed, who wants to snoop through our internet records and require our ISPs to stockpile data on the government’s behalf… That’s a worrying combination. But isn’t it good to have a strong woman role model in a position of political influence? I am a feminist and I welcome the idea of strong women holding offices of influence and playing an active role in the governing and direction of our country. This does not mean I have to like where their opinions and ideas are pointing us. If anything it’s an argument for MORE women to take on such roles – we need a cacophony of voices, dissenting opinions, a clamor of debate – before someone has the stupidity to assume that one powerful woman speaks for all women. I applaud Theresa May’s guts for getting up and doing the job, but I will not allow her to speak for me without caveat just because we share the same chromosomal pattern. You can also write to your MP about these issues. Remind them that they work for you, for your constituency and they represent your views. Make them aware if you disagree with these measures and make it clear which way you expect them to vote when these things come up in the House of Commons. Your silence will be taken as assent. Don’t let them think that if you disagree. Don’t delay on this if you have opinions. Remember the Draft Communications Data Bill is being proposed on Wednesday. It may not have escaped anyone’s notice that I was less than thrilled by the result of the election. But I have been a bit dismayed by the comments by conservative MPs toward the people who did not vote for them, implying that we are ‘sore losers’. Not just the people who voted for them. The conservative government are our employees – they work for all of the people of Britain. We are now their bosses. We should start acting like it, and they should start remembering it. I cannot ignore the fact that these guys are going to be running the show and influencing my life, and all of our lives, over the next 5 years and they are proposing some pretty major changes. I am not willing to accept these lying down or submit to what they are suggesting without a fight. This is not the same as being a sore loser. I am not going to spend the next five years complaining that the other guys should have won. That is futile. But, in accepting that the Tories are going to be in charge, I want to remind them, and everyone else, that they work for us. We are not supposed to give up and let them run rough shod over this country. They work for us, and they should remember that. And I will be here, in good media company, to make sure they do not forget. Well the first step in any war is to know your enemy, or in this case your employees. So I have begun researching and there will be a series of posts coming up over the weeks and months ahead to share the results of that research with you, and I hope that you will share it further. The name of this series of articles, which will hopefully continue over the next five years until the next election, will be Tory-Watch. A bit like the neighbourhood watch. I want to know what these bastards are up to and make people aware of their plans and intentions. My first step was to make a list of the promises from the Tory manifesto. All of it. All 80+ pages of statements and promises and intentions. These will be typed up and shared soon. We should be aware of what they promised to do for us, and hold them to account, to make sure they accomplish the good and to voice our protests against the bad. I have made a list of all of the Tory cabinet members and the key ministers in their departments. Each one will be getting a profile, including a brief history of their voting interests. Some of these are starting to appear on facebook/twitter, but we need to look at all of them. I’ve said it before, but I will keep saying it over and over: these people work for us. We can write to them, contact them and insist that they take into account the views of the entire electorate – not just the people who voted for them. I will be looking at some of the key issues and summarising points about them, and finding other resources that do the same thing to point people towards. This is not about reinventing the wheel – more about gathering wheels for a super-truck. As always, Project Shandy remains open for submissions, so if you want to contribute to Tory-Watch, please get in touch and let me know. The details of this call will be added to the ‘call for submissions’ page shortly. 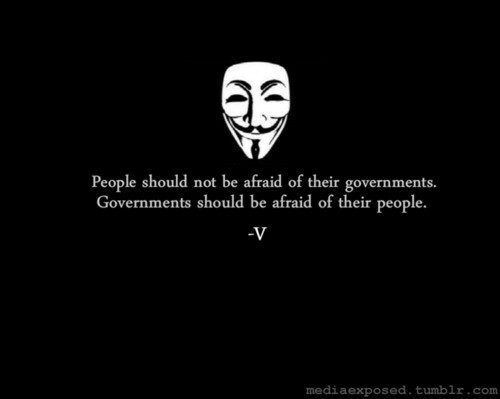 Watching V For Vendetta terrified me, because I could absolutely believe that those events would come to past. And now we’ve elected UKIP, a party whose sole intention is to isolate us from the rest of Europe, ‘cleanse’ our population of immigrants, remove our entitlement to rights to things such as maternity leave and sick leave and they have no policy for domestic governance in place. We are being made afraid. We should be more afraid of the people manipulating our fear.